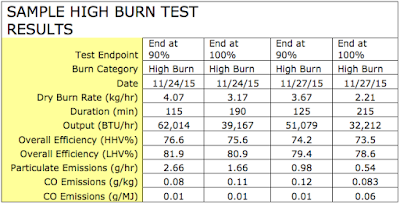 The 11/24 High Burn started when the Cold Start reached 15% of the test load (3.4#). 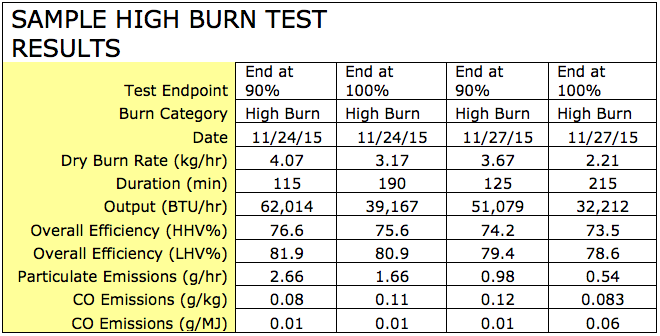 The 11/27 High burn started when at just under 10% of the test load (2.4#). The 11/24 load was packed tight (very little air space, and a relatively solid mass). The 11/27 load had smaller pieces on the bottom, bigger pieces on the top, and a little more air between the pieces. We are deliberately altering the start conditions and loading procedures to try to determine the range of possible outcomes for a High Burn using cordwood in this new stove. We indicate two results for each test: first where the test fuel load has reached 90% consumption, and second when it has reached 100% consumption. In other words, for the 11/24 test, the first set of results is when approximately 22.5# of a 25# load has been consumed, leaving a coalbed of 5.9# (3.4 start + 25# load less 22.5# burned = 5.9#). The second set of results for the 11/24 test is when the test load has been completely consumed (and the remaining coalbed is 3.4#, the same as when the fuel was loaded. Note the difference in output and emissions in each pair. Why report the test both ways? EPA has traditionally reported all test results when the test reaches 100% completion. The industry wants to report results for new cordwood tests when the test reaches 90% completion. Even High Burns can have long “tails” as you can see. The last 10% of High Burn fuel can take as long as 90 minutes to burn. As you can also see, the results are very different depending on how you define the test – start and end definitions, loading protocol, and fuel. More on high burns and suggested industry protocols will follow shortly.